For the first time, fan experience and the business of sports will have a dedicated track at NAB 2018 this month in Las Vegas. 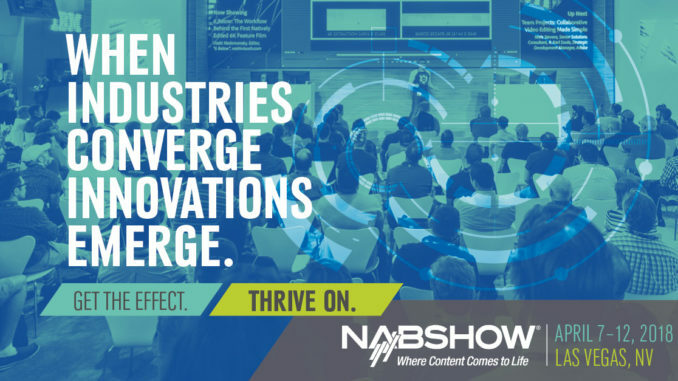 The National Association of Broadcasters annual trade show has become one of the world’s leading platforms for companies to showcase emerging trends and technology in new media. And this year, fan experience technology will have its own platform with one day dedicated to the business of sports. At TGSM, we strive to keep ourselves at the cutting edge of emerging technologies in fan experience. Our mobile brand activation assets utilize much of today’s most advanced fan experience technology, and we constantly make additions and updates to ensure that they are forward compatible with emerging trends. This panel will feature a lineup of top-tier influencers from across the spectrum of the business of sports. Lisa Borders, President of the WNBA will be joined by Stephen Espinoza, President of Sports Programming at Showtime; Raul Gutierrez, Executive Director for T-Mobile Arena; with Chris Ariens from Adweek serving as moderator. Sports programming is still the king of live TV, but the distribution of live events is becoming increasingly complex with each passing season. New platforms, channels, and technologies are an ever-present reality for those who work in the business of sports, and today’s teams and venues must keep up with the evolving landscape in order to maximize their exposure within their existing and potential fan bases. This expert panel will discuss recent and upcoming changes, and share insights about winning strategies in this challenging environment of perpetual change. More than ticket sales, merchandise, and even advertising sales – sponsorship is the single biggest source of revenue in the business of sports. Today’s leagues, teams and venues compete for lucrative sponsorship contracts with some of the biggest brands in the universe – and those brands often sign long-term contracts for exclusive sponsorship status. This expert panel will feature moderator Nathan Gaines, EVP Business Development for Whistle Sports. Nathan will guide Rick Arpin, SVP Entertainment for MGM Resorts; Dominic Curran, Head of Sports at Engine Media; and Steve Mandala, President of Advertising for Univision and more as they probe the current state of sponsorship relationships and contracts in the business of sports. Panelists will discuss the art of matching sponsors with audience segments – and the magical fan experience that can occur when the interests of sponsor, team, and fan overlap. New Technologies in Sports: Fad or Fan Favorites? In what we think will likely be the most important talks at the entire conference, Sports Video Group’s Brandon Costa will lead a panel through a discuss of emerging technologies to establish which technologies will become the new face of the modern sports fan experience, and which will be revealed as passing trends. A few panelists include Ashok Balakrishnan, SVP of Technology at Sportradar; Eric Black, CTO at NBC Sports Digital; Sohrob Farudi, CEO at Fan Controlled Football League; and David Gandler, CEO at fuboTV. With an overwhelming array of emerging technologies jockeying for position in the world of sports distribution, it can be hard to separate the wheat from the chaff. This panel will help managers in the business of sports to determine which technologies are most likely to demand investment over coming seasons, and which are more likely to quietly fade away. The group will discuss fantasy sports, esports, 3D video, mobile applications, and much more. Tailgating Sports Marketing has a fleet of ready-made mobile brand activation assets that are ready to deploy at any sports and entertainment venue today. We’ve included all the industry’s most promising new technologies to create a one-of-a-kind tailgating fan experience that you won’t find anywhere else. If you’re looking for a way to deploy social media integrations, mobile data harvesting techniques, or innovative interactive digital gaming promotions – you need to see TGSM’s mobile brand activation assets. Our units are specifically designed to engage and retain the most sought-after demographics in any audience. We attract women and families with luxurious full-service restrooms that have hot water, comfortable changing stations and full-size flushable porcelain toilets. Our sanitary, luxurious accommodations are an oasis of comfort on any tailgating lot. Independent studies have demonstrated that just having one of our units present on a tailgating lot has a profound impact on attendance and duration-of-stay for women and families. We bring millennial fans to your doorstep with a free high-speed Wi-Fi data network, broadcasting a branded invitation to connect and share – at no cost to fans. As fans accumulate around the mobile asset, they are continually engaged by a combination of interactive screens and games, a stereo broadcast sound system, a free branded mobile application, a socially-integrated selfie station, and more. At every stage of their interaction with our units, fans are invited to opt-in for updates, offers, and notifications – allowing you to harvest a wealth of anonymous data that will continue to pay dividends long after the day’s event is over. If you want to learn more about how TGSM’s mobile brand activation assets can improve your fan experience, give us a call today at (888) 995-2285.